A mesocyclone is the rotation in the severe thunderstorm. this occurs when the an approaching low pressure cold front advances form the west coast Pacific Ocean, and a low humid windfield forces northward out of the Gulf of Mexico. These mesocyclone events usually happen in an area known as "tornado alley". The below map shows the area of the majority of these mesocyclone events. The next images kind of illustrate how these storms get going. The rotation starts in a horizontal fashion, then with daytime heating, the rotation tilts upward picking up energy with the updraft heating. See examples Below. Before thunderstorms develop, a change in wind direction and an increase in wind speed with increasing height creates an invisible, horizontal spinning effect in the lower atmosphere. This called a mesocyclone. Rising air within the thunderstorm updraft tilts the rotating air from horizontal to vertical. A low level moisture cloud "wall cloud" is usually present in rotation mode below the base level of supercell. An area of rotation, 2-6 miles wide, now extends through much of the storm. Most strong and violent tornadoes form within this area of strong rotation. The tornado forms out of the rotating wall cloud. Meteorologists rely on weather radar to provide information on developing storms. The National Weather Service is strategically locating Doppler radars across the country which can detect air movement toward or away from the radar. Early detection of increasing rotation aloft within a thunderstorm can allow life-saving warnings to be issued before the tornado forms. As these radar images are monitored, it is really clear that tornadic rotation can be present. These radar readings are responsible for countless lives saved by advance warning. Below is an example of a possible tornadic storm that will prompt a warning. On the radar readings Severe Weather Analyst - John Hallen will look for the supercells to show a hook echo. In the illustrations below this text shows a radar image of a supercell that is going in tornadic mode. 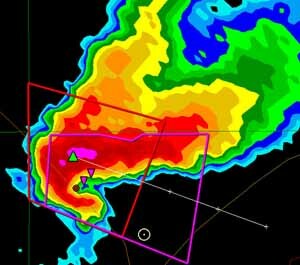 Below is an image of a "hook echo" from the ground level. This is the start of the mesocyclone that is in tornadic mode. The outflow is evident on the left of this photo. Also evident is the "hook" as this supercell is in great rotation.